Well I seem to have misplaced the last four days. After a lovely sunny and productive weekend of gardening, this week has been cold (by our standards) and bleak weather and both kids and myself have been under the weather. So apart from work I have not been near the computer. But I started making a couple of things the other day after being inspired by LJ’s gorgeous piccies from their visit to the strawberry patch. I have a few more things I want to make for this, some of it to play with some of the new actions I treated myself to from Atomic Cupcake whilst everything was on sale. The first bits I made are here for those who would like them. I was very excited on the weekend because I found the ginger mint I wanted, a lemon mint, and a native peppermint. Along with the others I have found I am only missing spearmint. They have all taken to their spot along the retaining wall very well and best of all the wonder dog has not dug them out. There is even a light bit of rain today watering them in nicely. Erika - what, no plant scanning? LOL!! You are the queen of the scanner and frankly, I'm disappointed! I was going to put you in my suitcase too! Nevermind - must do better!! LMAO! omg! did you read my mind?! i was looking for some strawberries just this morning! i have fond memories of growing them when i was small and my dd chose them for her part of our garden this year. these bits will come in perfectly for scrapping this summer! ty ty ty! erika, you have to have to have to post piccies of all your wonderful mint plants! i love mint and there is a terrible selection here. although i did see some spearmint ... perhaps we could trade, lol? ya know, maybe vicki has the right idea ... perhaps you should scan some leaves from your garden! Thanks for the elements, and I hope you feel better soon. Thank you - I love these. Perfect since we are going strawberry picking in a couple weeks. Erika - wow, I love these. Thanks!!! I'm glad you liked my pics and these will match perfectly. Thanks!!! 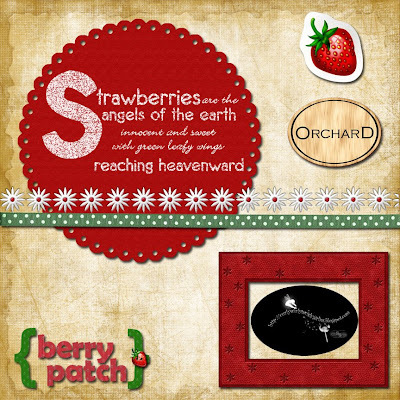 Thank you for sharing these wonderful berry kits! They will surely get used (and fairly soon, too). I really appreciate your work and your generosity in sharing it with people like me, who can't do anything of the sort themselves. Thank you once more and greetings from Finland!